262 pages | 18 B/W Illus. The ‘High Treason Incident’ rocked Japanese society between 1910 and 1911, when police discovered that a group of anarchists and socialists were plotting to assassinate the Emperor Meiji. Following a trial held in camera, twelve of the so-called conspirators were hanged, but while the executions officially brought an end to the incident, they were only the initial outcome as the state became increasingly paranoid about national ideological cohesion. In response it deployed an array of new technologies of integration and surveillance, and the subsequent repression affected not only political movements, but the whole cultural sphere. 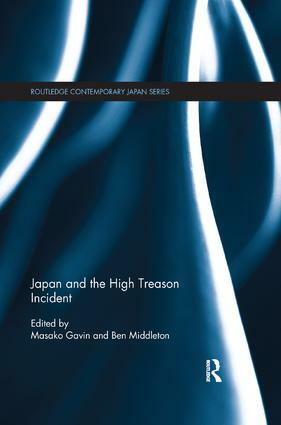 This book shows the far reaching impact of the high treason incident for Japanese politics and society, and the subsequent course of Japanese history. Taking an interdisciplinary and global approach, it demonstrates how the incident transformed modern Japan in numerous and unexpected ways, and sheds light on the response of authoritarian states to radical democratic opposition movements elsewhere. The contributors examine the effects of the incident on Japanese history, literature, politics and society, as well as its points of intersection with broader questions of anarchism, colonialism, gender and governmentality, to underline its historical and contemporary significance. With chapters by leading Western and Japanese scholars, and drawing on newly available primary sources, this book is a timely and relevant study that will be of great interest to students and scholars working in the fields of Japanese history, Japanese politics, Japanese studies, as well as those interested in the history of social movements. Masako Gavin is an Associate Professor in Japanese Studies at Bond University, Australia. Ben Middleton is an Associate Professor of Sociology at Ferris University, Japan.